Over the years O Beach Ibiza pool parties have become famous the world over for their fun, tongue-in-cheek production. Each winter Brand & Event Director Gem is tasked with making the summer ahead bigger and better than the last – it gets harder every year. 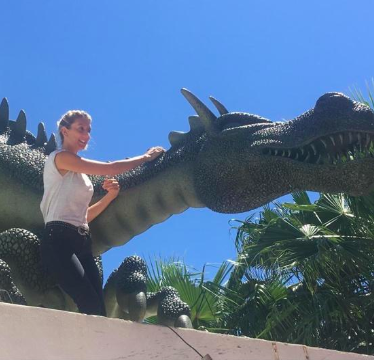 Here, Gem takes us through the making of 2018’s Dreamland Pool Party. After the success of our circus theme last year I was anxious about pulling a totally new idea together and it took some time, but after a lot of ideas were chucked around we eventually came up with the theme for 2018: ‘Dreamland’. We love our shows to be interactive, and Dreamland gave us the perfect opportunity to create theatrical characters and special moments throughout the club, whether that be from the crane, on the stage, or on the dance floor with our clients. Here I’ll talk you through some of those moments, where the inspiration came from and how we created them. Creating our very own living doll show meant we could kick off the Dreamland party with a feeling of nostalgia, a bold display of colour alongside a big injection of fun. For this show, we have a Jane-in-a-Box – a contemporary adaption of the traditional Jack-in-a-Box which was designed with a vintage feel in mind. Jane herself was inspired by an image of Lady Gaga that I adore, but with a modern spin. Trendy, pastel hair colours and space buns keep Jane fun and contemporary. I wanted a parade of living dolls to accompany this show so in keeping with the vintage style of Jane, we concepted beautiful wind-up, music box ballerinas that move around the beach club to select, ballet-inspired choreography to keep them in their graceful character. The costumes were produced by a genuine ballet costume designer in Madrid for authenticity. We also co-ordinated the show with a music box track created by our resident DJs to ensure the moment is an all encompassing experience. Moving on from the dreamy world of the Living Dolls – next up is the stuff random Ibiza nightmares are made of: Queen Kong has kidnapped one of our dancers and is on the run, dominating the the skies of the beach club. We wanted to create an iconic moment with the infamous, giant movie monster, but with our own stamp on it. We were very selective of which materials we used, from the candy coloured, faux fur to the pink glitter so that the sun would reflect off it and capture her in all her glory. We carefully studied images of the original King Kong to ensure the features were identical. On the ground we have the I Saw It First Army trying to keep our guests safe from the beast – they’re under command of our very own Sergeant Sassy, who we think is summed up by her title. She sits upon her throne in the guise of a big pink tank which ONLY fires out confetti and love. 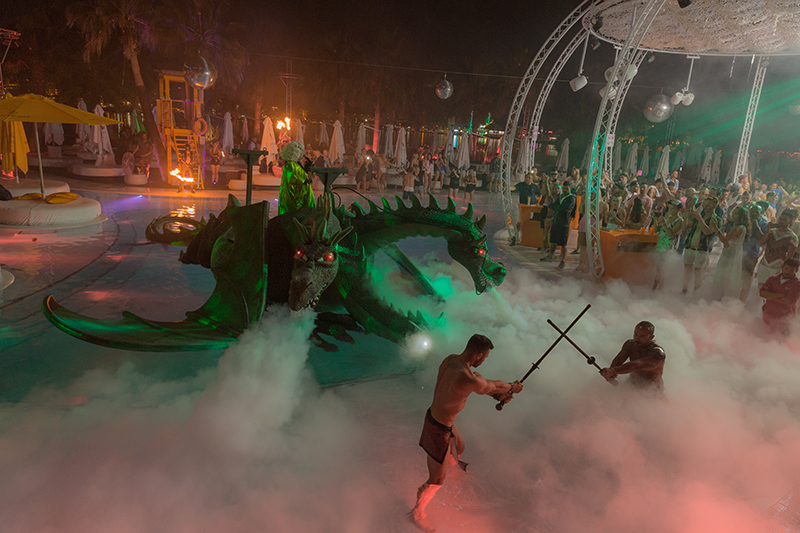 Our fantasy wouldn’t be complete without a fire-breathing, mythological creature so step forward our majestic three-headed dragon, which descends upon the beach club at dusk in full force. The idea was to put on a dramatic show that evokes fantastical energy across the venue and heightens all human senses with a mix of fire, music, visual fantasy and a finale that leaves the audience wondering whether they really were in Dreamland. As the dragon flies into the beach club, billowing smoke emerges from the mouths while its queen, perched upon it, enchants us with a dragon call in way of an operatic version of Evanescence’s ‘Bring me to Life’. Medieval performers entice the beast in with fire shows below, and pyrotechnics across the club that reach a culmination crescendo before the Faithless track ‘Insomnia’ bellows out, doing exactly what it says on the tin and awakens everyone from the dream and they find themselves back in Ibiza 2018. Purchase tickets to a Dreamland Pool Party here.